It's the first Monday of the month and time for another Cupkins post. Thanksgiving is just around the corner so this month's theme is all about Turkey Day! If you're a regular reader you know that Cupkins is normally a collaboration of cupcakes and muffins between Joanne of Ready, Set, Craft! and myself. Since Joanne has been sick with the flu I'm playing substitute and made some cupcakes too. 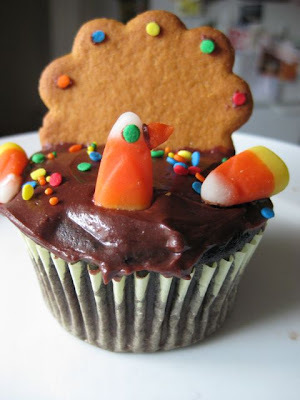 Today I've got Turkey Cupcakes and Corn Muffin Stuffing. It's perfect for Thanksgiving but easy enough to make for any meal because I use store bought muffins (this is probably the only Cupkins post you'll ever get from me using a store bought muffin). 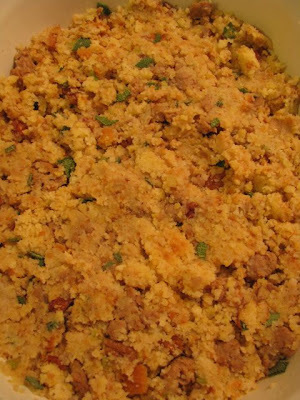 The recipe makes enough stuffing for 6 but if you have a larger crowd or your family likes to eat a lot of stuffing with the meal go ahead and make more it's a very "loose" and adjustable recipe. In the pictures you'll see I cut the recipe in half- simply because I didn't want to make stuffing for 6 so close to the holiday. You could do the same for a regular meal. 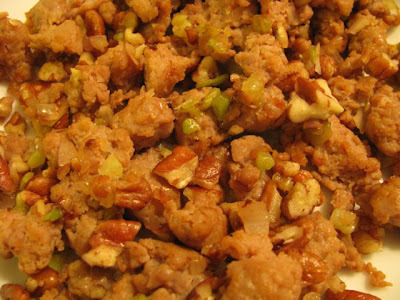 1 package of bulk turkey sausage, about 1lb (you can use regular, we just like turkey). Start by lightly toasting the pecans in a dry skillet over medium heat. When the pecans just start to toast (they'll smell nutty and the oil in the nuts will sizzle a little) remove them from the pan and set aside. Spray the skillet used for the nuts with nonstick spray and brown the sausage and drain off excess oil (if you can't find bulk turkey sausage you can remove the casing from links). Add the shallot, celery and oil. Cook until they are translucent. Now turn off the heat remove from skillet to a baking dish, add nuts and stir the mixture together. In a large mixing bowl break the muffins up into chunks. Chop the sage leaves up and add them into the same bowl with the corn muffins and stir together. 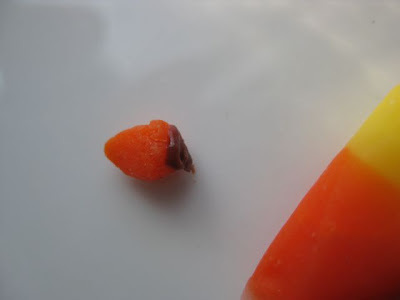 Combine with the sausage mixture in the baking dish. Add salt and pepper to taste (a few good shakes is usually enough). Warm 1/2 a cup of chicken broth in the same skillet you used for the sausage nuts and veggies. Add warm broth a little at a time stirring the stuffing mixture until the desired consistency is reached. 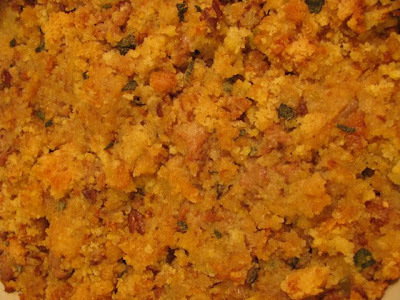 Remember the stuffing will dry a little in the oven. Bake covered at the same temp as the turkey until nicely browned (usually about 30 minutes). If your making this for a weeknight meal bake at 350. 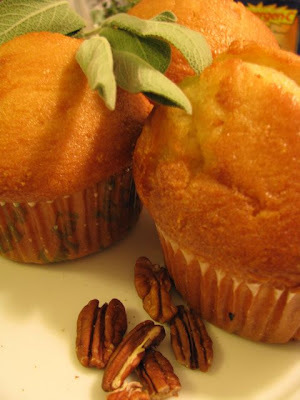 The sage and pecans taste delicious with the corn muffins! 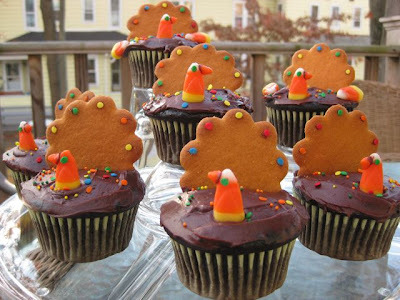 Now for dessert- Chocolate Turkey Cupcakes. You can use your favorite chocolate cake recipe or a store bought mix. I used a store bought one to save time. 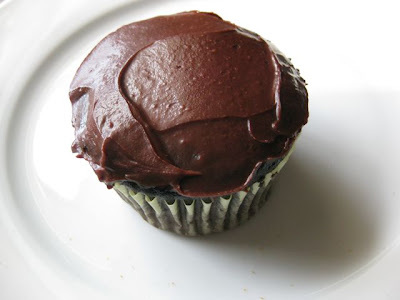 Start with cooled chocolate cupcakes and frost the tops. 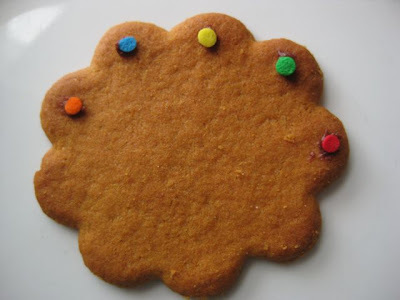 Next we are going to use frosting as glue to stick some sprinkles onto the cookie. Use a toothpick to dot a very small amount of frosting onto each scallop only going halfway around. 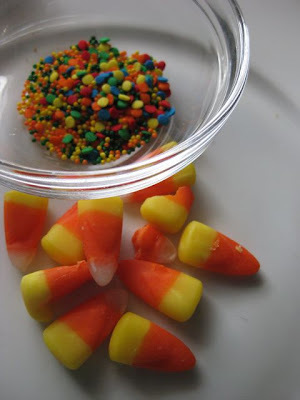 Place a sprinkle onto each dot of frosting. The undecorated half of the will get stuck into the cupcake and become the tail- but only do this just before serving! I found out the hard way today that the cookies get mushy from sitting in the frosting and fall over. 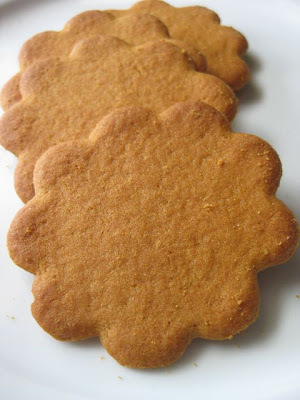 This might not be the case for a thicker cookie- but the thin ones I used only stood up for a few hours. 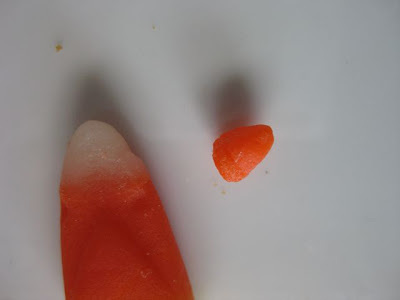 Cut a few pieces off of the orange part of a candy corn and mush it into a triangle beak shape. 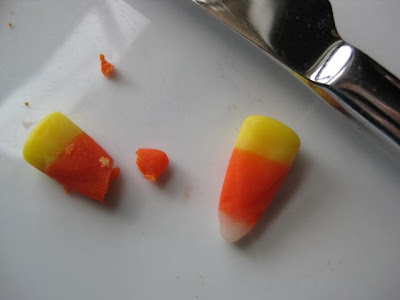 The candy corn is remarkably clay-like once you start mushing it up. 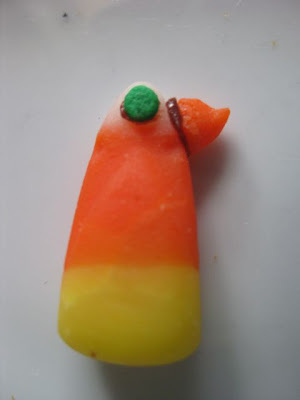 Use frosting to stick the beak to the top of another whole candy corn. 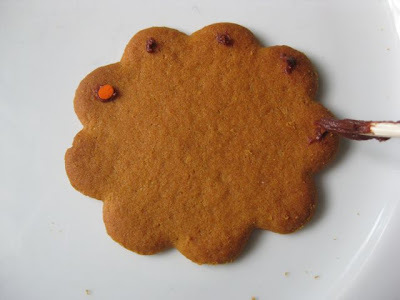 Make a a little dot of frosting where you want an eye and stick on another sprinkle. 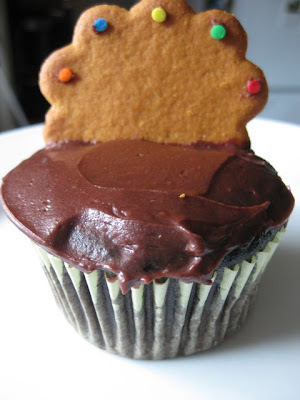 Now you have a cute little turkey body ready to stick into the front of the cupcake. Last but not least add more sprinkles for color. 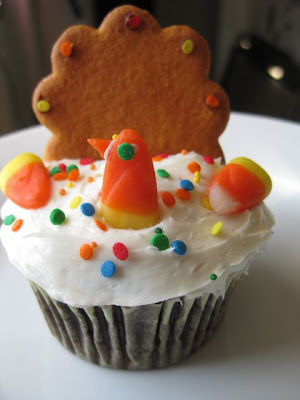 You can also add one candy corn on side for wings- I'm not sure if I like the wings or not, you decide. And here's the whole flock! Using white frosting like I did for the picture at the top might look more like a turkey, but we are partial to chocolate in this house! And finally in honor of the biggest food holiday of the year Joanne and I will be brining you an "extra helping" of cupkins with two more great recipes later this month!